Yet again, your webmaster will be running a daily blog—day job permitting—which will keep you abreast of developments, discoveries and the inevitable transient theories feeding heated debate over copious cups of tea. Pop back to this page for the latest news and pictures. 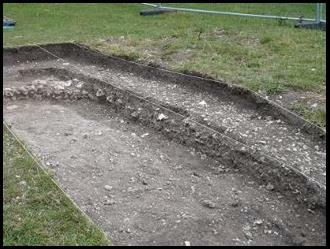 As a reminder, these are the trenches we have dug over the last three years. You can see from the underlying geophysics how the trenches have generally be chosen to correspond with anomalies, or breaks in the topography which could indicate structures. So far we have been lucky (or inspired) in our choice of feature to examine. Let’s hope our luck, and the weather, hold. Saturday 31st July and many hands to the pumps. 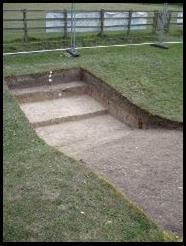 We open two trenches in the morning, one to the south-east of trench 6, over the original sewer outlet from the rear of the south range. Another on the south side of the supposed water feature. Trench 19 goes in after lunch to the east of last year’s trench 3 to pick up the gravel terrace close to where the stream from the Lockburn still runs. A productive day with the turf lifting helped by very dry soil. 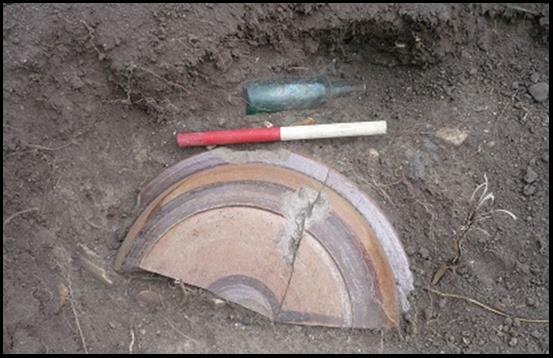 First major find, by Don, was a magnificent bowl, some 30cm diameter, in association with a glass medicine bottle. Clearly rubbish fill, but a motivating find nonetheless. 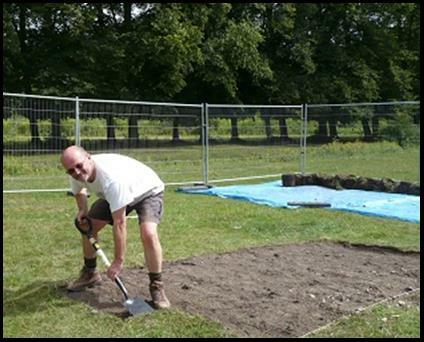 Webmaster has been spotted, at last, lifting the turf from trench 19, so he’s not just there to make notes and take pretty pictures (or make them). 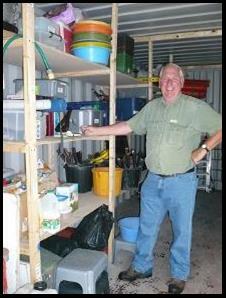 Sad tale of the day was the fact that Techer Jones spent much of Thursday evening building shelves for the container which was hired to hold the WARG equipment on site. The chap who delivered the container was most apologetic, but would we be happy to accept a container with one half devoted to nice, robust, just the right size, shelving. Graciously accepting the enhanced facility, Techer was later to deny using any expletives, nor seen touting firewood in the Owslebury area. 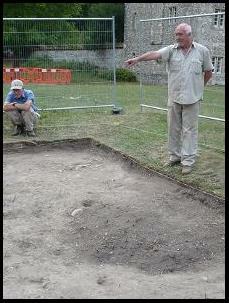 Sunday 1st August saw the fourth (trench 17) opened. This was on the south side of the park, examining the bank and ditch close to the St. Cross cricket ground. 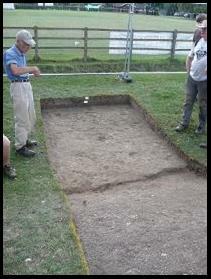 The success of trench 10 last year with the Anglo-Saxon pits in trench 5 has raised hopes in this area, and the form of the ditch was quickly revealed. A different profile seems apparent with no steep sided V-section yet. 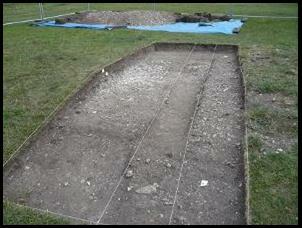 This trench revealed a complex development which is still to be bottomed out. The creation of the cricket ground (over 100 years ago) may also have impacted on some of the fill (as well as the progress of the diggers as shouts of “Owzat” echoed around the park). Trench 13, located over where we think the original Lockburn diversion culvert flowed out into the water feature, failed so far to live up to its early promise, although a further large part of a pot was revealed—possible the same pot as yesterday, but still in situ so not positively identified yet. The trench features a massive tree throw and intermittent stony deposits which could be rubble from the culvert. 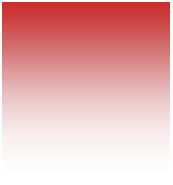 This trench will gradually be exposed over the fortnight and various changes of view and opinion are expected—nothing new there, then. 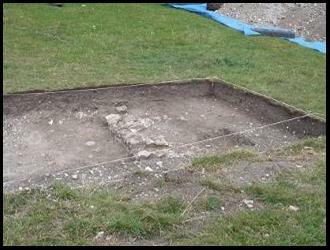 Into the knitty-gritty, our diggers begin the long task of exposing our site, layer by layer. Our culvert trench (13) looks little different, but the trench with the supposed pathway (19) on the edge of the water feature popped up with a surprise. The chalk packing apparently underlying the path appears to be on a different alignment to the path, and could be an earlier feature. The sondage has now been reduced to half a metre to try and clarify the relationship between the contexts. Further to the west the supposed rubble in trench 16 has been investigated to see both its make-up, and to try and bottom out the depth, with our history (Garrard’s history) of rubble fills this one could just keep going down. 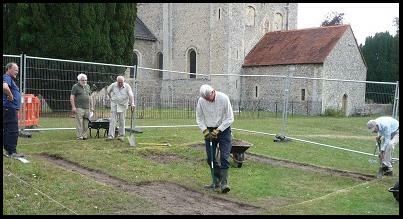 The trench near the cricket pitch continues to baffle as a meticulous excavation tries to establish the nature of the south side of the bank and ditch. 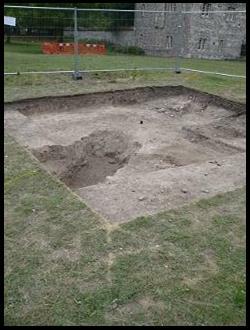 Funny thing, Archaeology, just when you thought your biggest prize lay under a particular piece of turf, the most mundane and least likely trench comes up trumps, perhaps. Again time will tell. 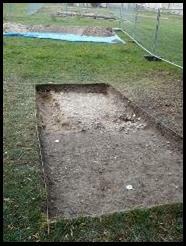 Trench 13 had now puzzled excavators with its lack of a clearly visible culvert, but the fossil remains were there that something had happened and it was now a case of carefully unravelling ‘what’, and can we see a robbed out ditch respecting the realignment found in trench 9 last year? The yellow marks on the grass indicate the geo-physics alignment of the culvert, respected by the ground disturbance, in this photo not yet absolutely proven. But on Friday, literally a breakthrough, as the expected culvert rubble becomes the end of a culvert proper. Remote sensing expert Garrard wasted no time taping a video camera to a pole and investigating the depths, wherein it was found that the culvert is lined with quality dressed greensand blocks. The really interesting thing is what these blocks indicate about the history and dating of this feature and its relation to the South Range. Trench 9 last year by no means proved that this earlier culvert post-dated the demolition of the range, as the latest culvert obviously did, and the greensand could indicate a much earlier phase, which in turn would say something about the water feature itself. 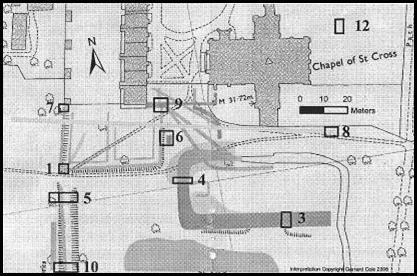 The poor underlings who have funded their way through part-time study to call themselves “qualified” and be given their own trench to oversee, direct, monitor and record, were given remote trench 19 which was to prove that a pathway existed along the edge of the water feature. Well they’ve actually produced the first structural feature, namely, a wall — on the outside of the water feature, in the park. This could be some feature associated with the lower part of the “water feature”, even the remains of a milling or fish-farming structure. Today the possibility of a second wall running at right angles and to the south started to show, so maybe there is a small building here. The wall is very narrow, so wouldn’t have born a heavy load, so could be a byre, sty or, judging by the proliferation of animal bones being found south of the path, a small slaughterhouse. Very, very exciting.